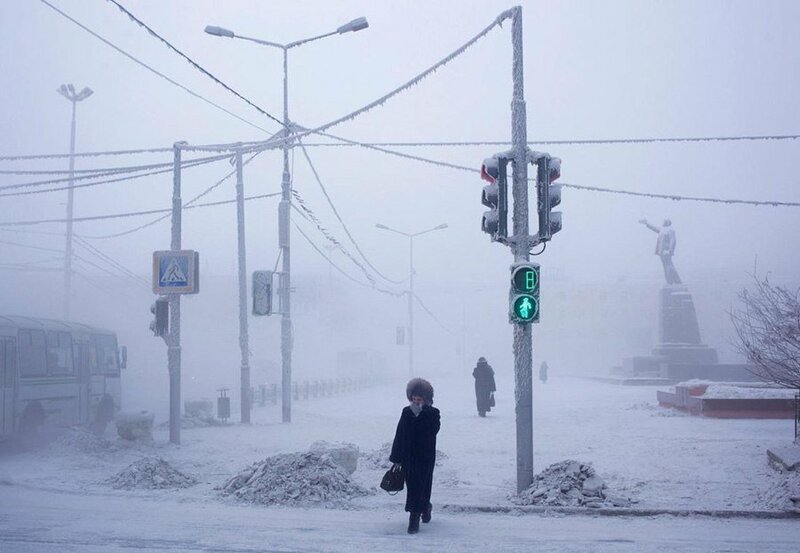 Blizzards and snowstorms aside, you should probably be grateful that your winters look nothing like Oymyakon's, the world's coldest city. 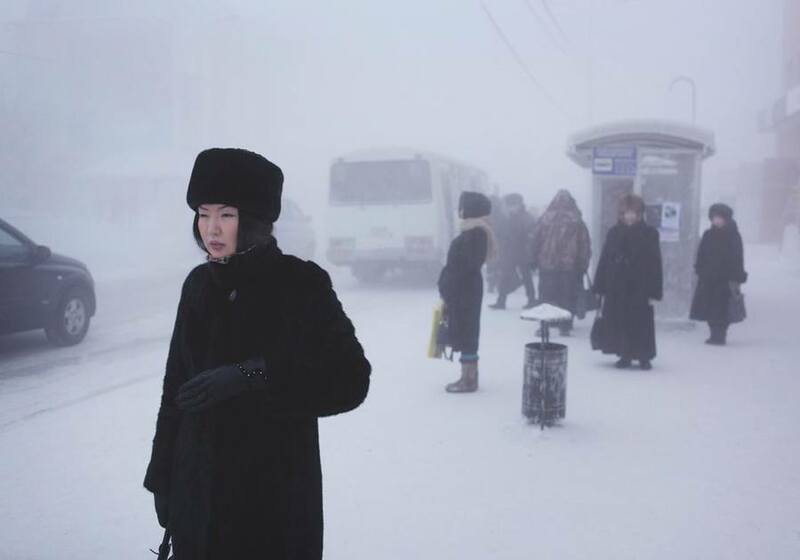 akutian woman amidst the fog of city center – created by cars, people, and steam from factories, the fog is thick and heavy through the coldest weeks of winter. As New England braces for what many have called a “historic snowstorm”, one city in particular has it even worse, and just about every single day. 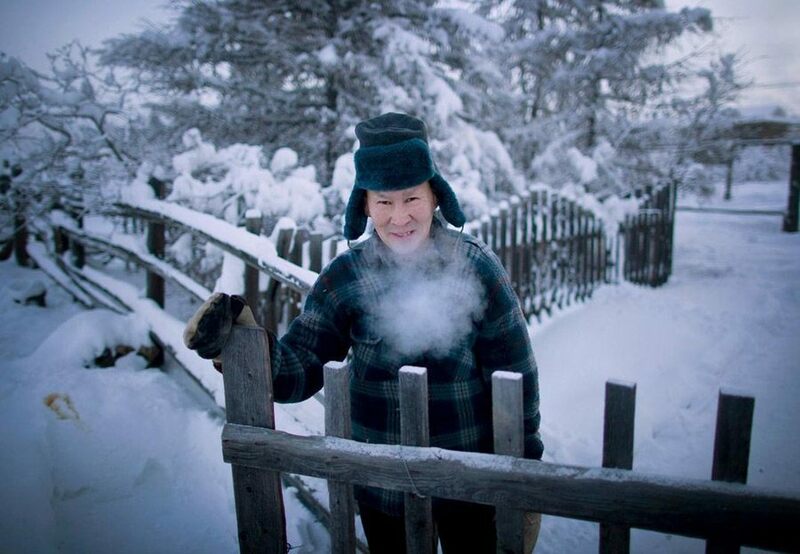 People in Oymyakon, Russia face frigid temperatures like no other place on Earth. 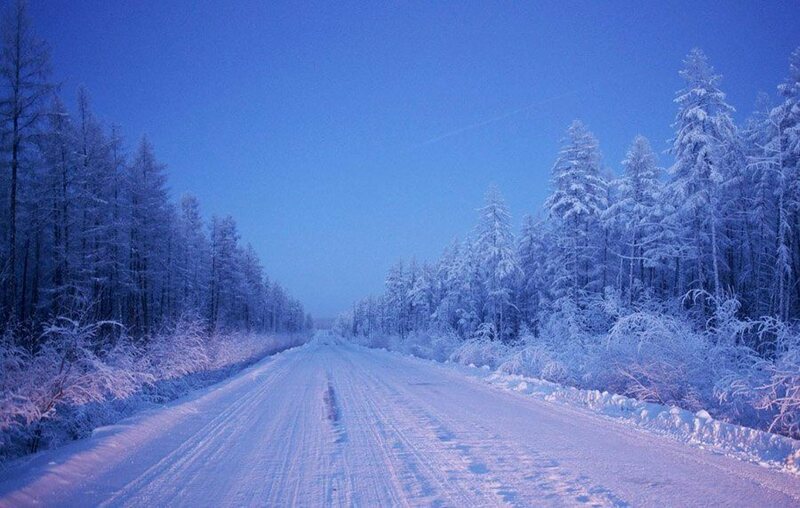 Located just a few hundred miles from the Arctic Circle, Oymyakon is the world’s coldest permanently settled area, nestled deep in the Russian tundra. New Zealand photographer Amos Chapple recently made an expedition to the region to document the daily life of its inhabitants. Chapple found that the residents of Yakutsk, the nearest city in the region, were surprisingly wealthy and described the city as cosmopolitan. 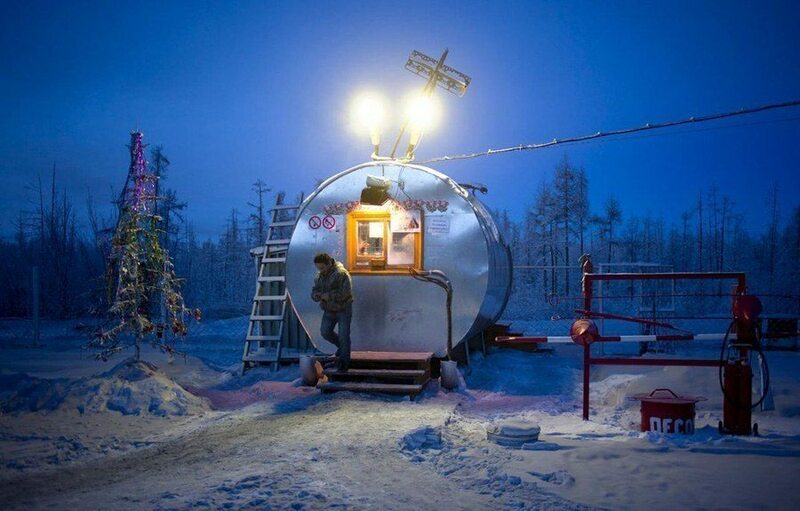 The affluence comes from the plentiful resources around Yakutsk including oil, gas, and diamonds. But is it worth it to live in the coldest city in the world? Working two weeks on and two weeks off, employees of isolated regional 24-hour gas stations are vital to ensure that the economy can keep running in spite of inclement conditions. 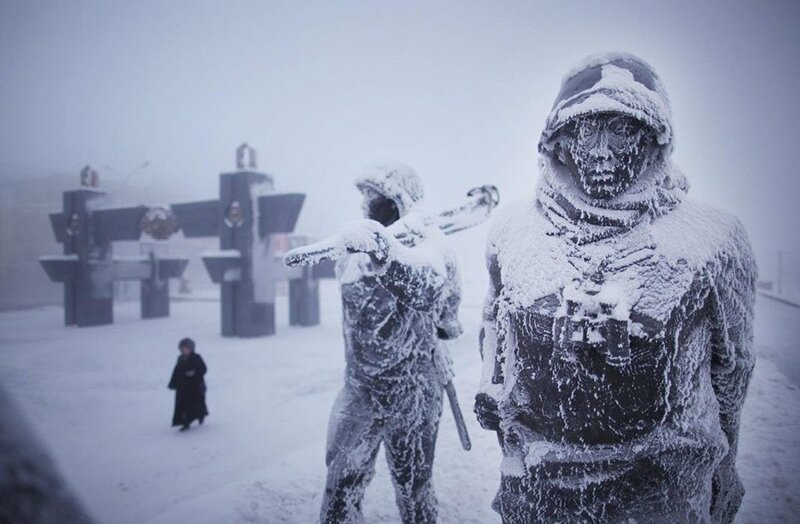 Statues of soldiers stand frozen in a park dedicated to the fallen of World War II. 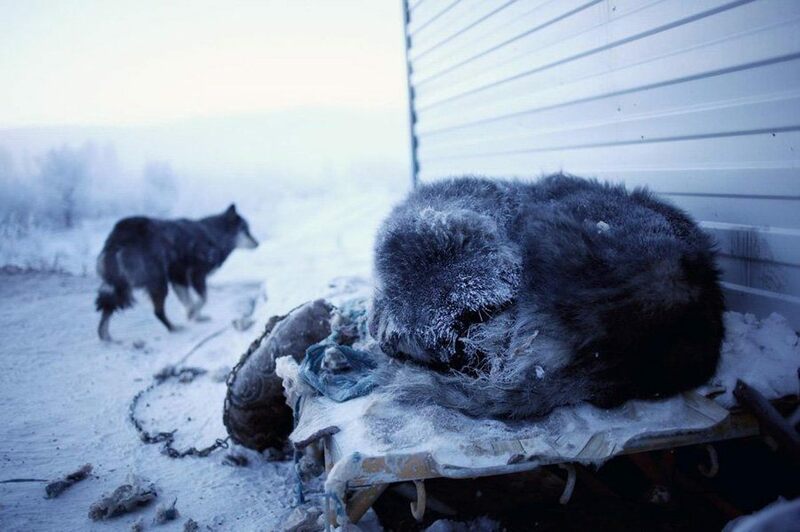 It isn’t only people who have to deal with the dangerous conditions; a dog curls up to sleep and keep warm in the carpark outside of Café Cuba. Constructed by gulagged prison workers and known as the “Road of Bones”, Russia’s Kolyma Highway is the only major land route into or out of Yakutsk. 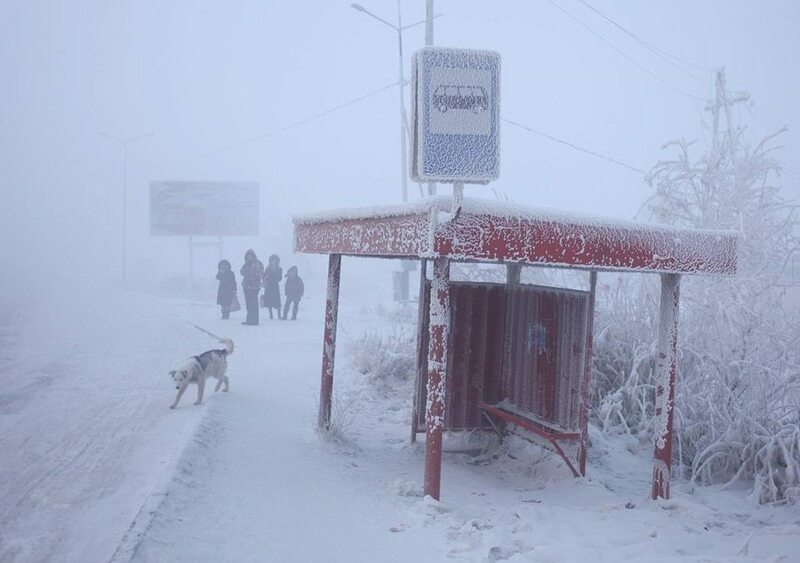 A dog hesitantly makes its way onto the street near an icy bus stop in Yakutsk. 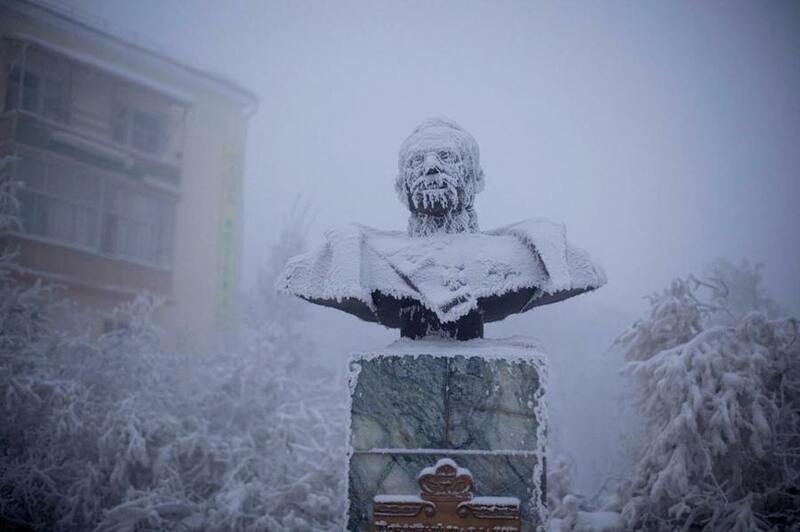 One of the first governors of Yakutia, this bust of Ivan Kraft stands covered in ice for the majority of the year. 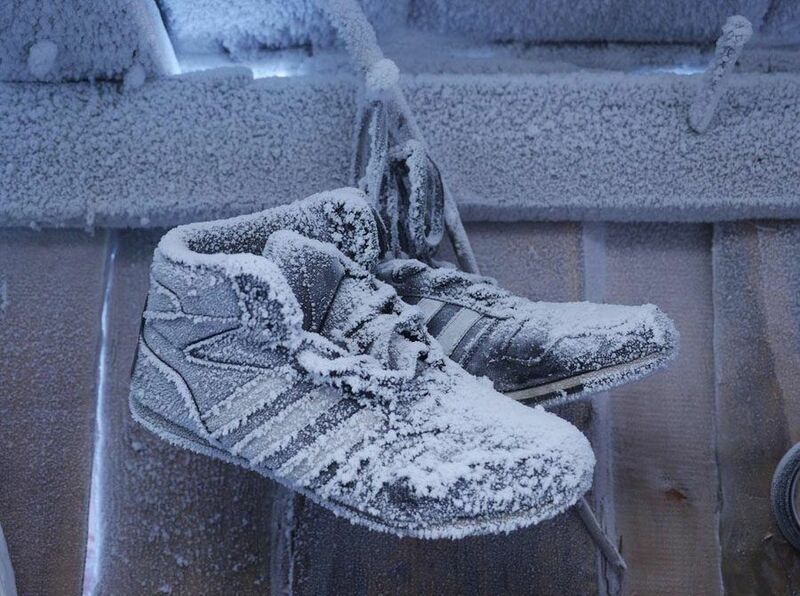 Someone’s summer shoes hanging inside a shed in the Yakutsk suburbs, waiting out the long and frigid winter. A swirl of steam and freezing mist surrounds a woman as she enters Preobrazhensky Cathedral, the largest in Yakutsk. On a day of -63 °F, a woman covers her face with her mitten to protect it from the dangerous cold. In the background a statue of former Vladimir Lenin can be seen. 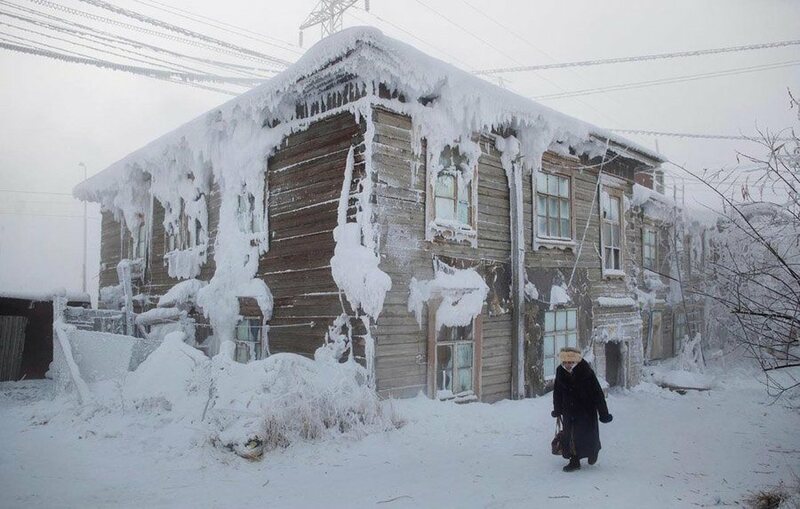 Ice-covered houses like the one shown here are common sights in the middle of Yakutsk. 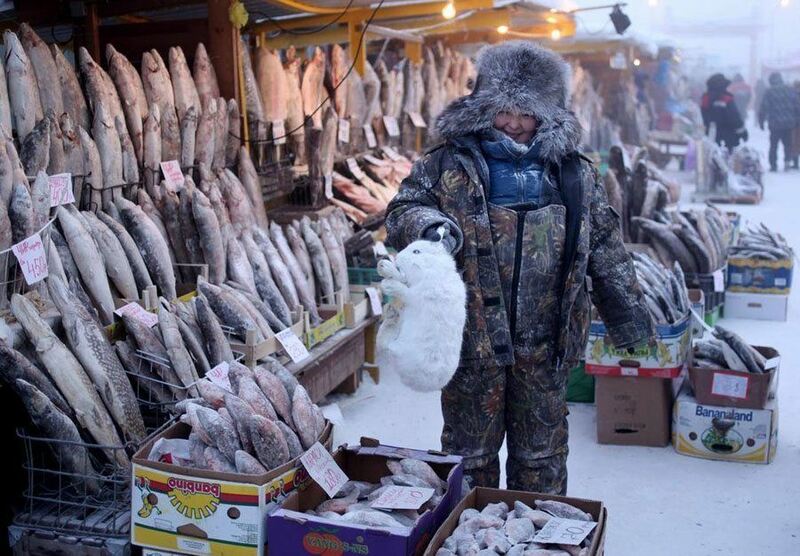 There is no need for refrigeration at the public market; the frigid air ensures that the fish as well as the rabbit stay frozen and fresh until they can be sold. 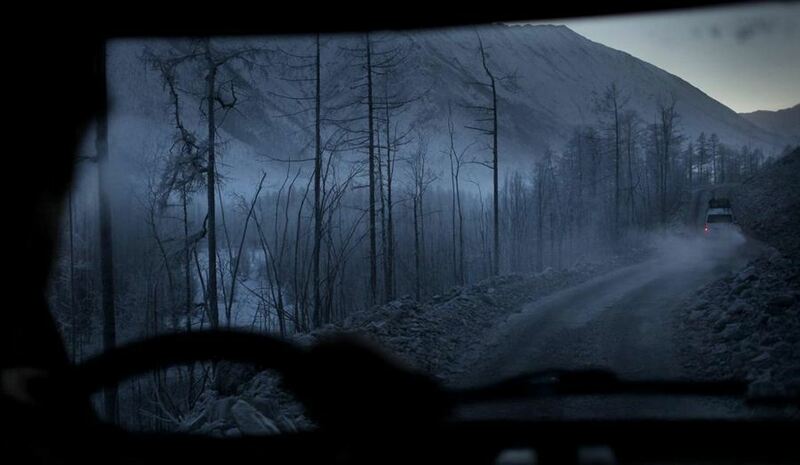 On the way to Oymyakon, gasoline can freeze solid if the vehicle is not left running. Sometimes during long night drives the driver will stop in the middle of the road and sleep in the car with lights shining and the engine running. 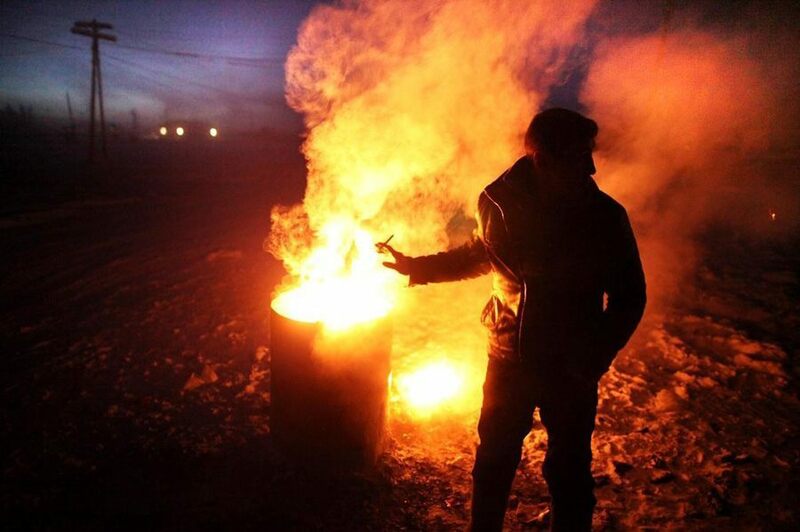 A man uses a torch to thaw the driveshaft of his frozen truck. Due to the difficulty of digging plumbing in the region, most bathrooms are pit latrines out on the street. Retired school teacher Alexander Platonov bundles up to make the dash to the toilet. 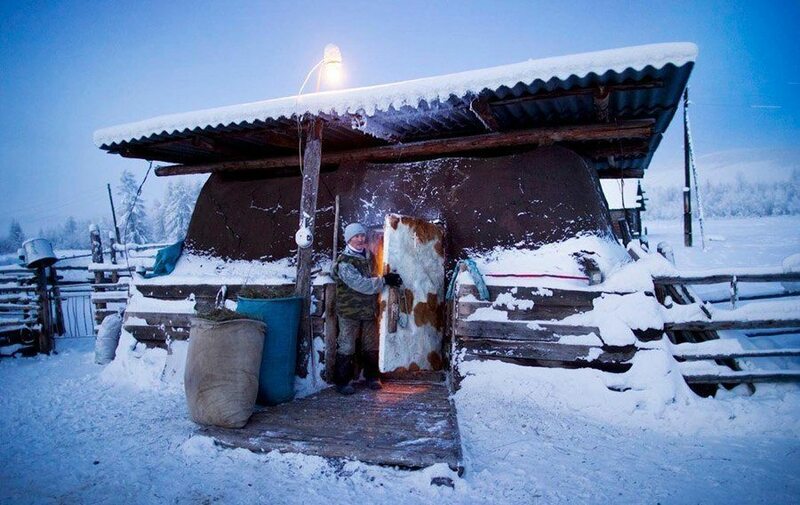 To keep his cows from freezing, farmer Nicholai Petrovich has a highly insulated stable that they sleep in at night. 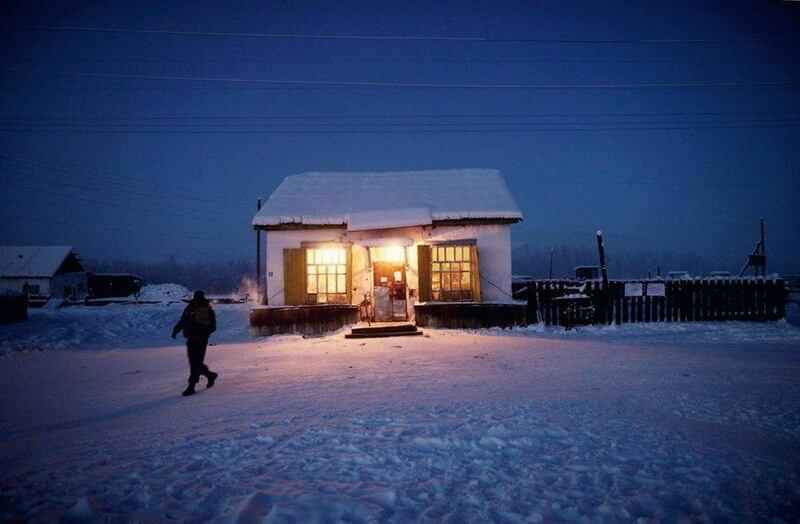 Oymyakon has but one shop to provide supplies to the remote and isolated community. 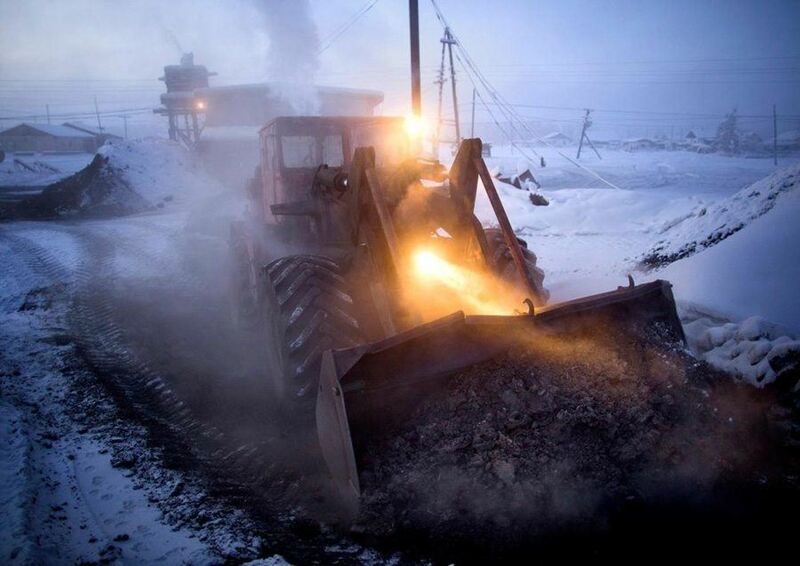 Early each day this tractor is used to supply new coal to the plant and remove the burnt cinder from the previous day. 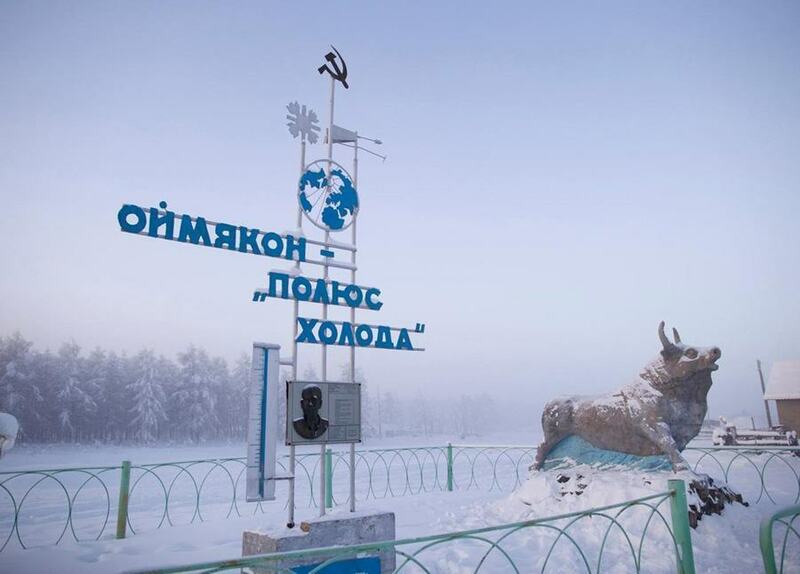 A Communist-era sign which reads “Oymyakon, The Pole of Cold” marks the record breaking low of -96.16 °F in 1924. 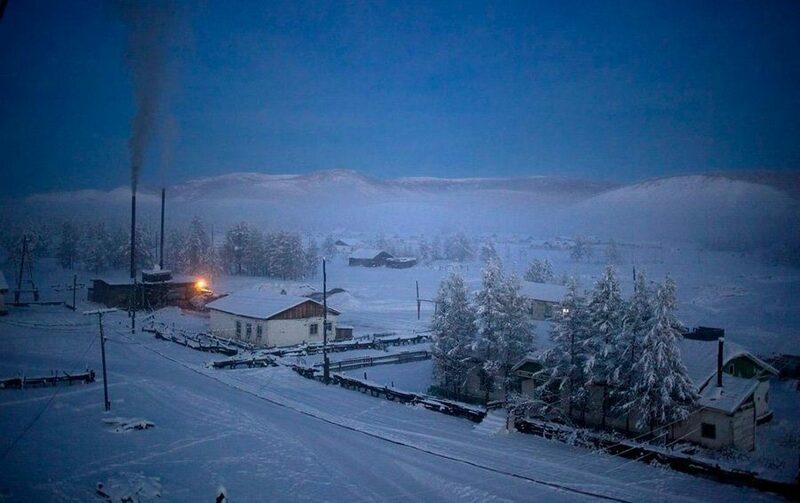 Oymyakon’s heating plant runs round the clock with an ever present plume of smoke rising into the winter sky. If you were fascinated by this look inside Oymyakon, the world’s coldest city, you’ll enjoy our other posts on the Swedish hotel made out of ice and the seventeen most unbelievable places on Earth.